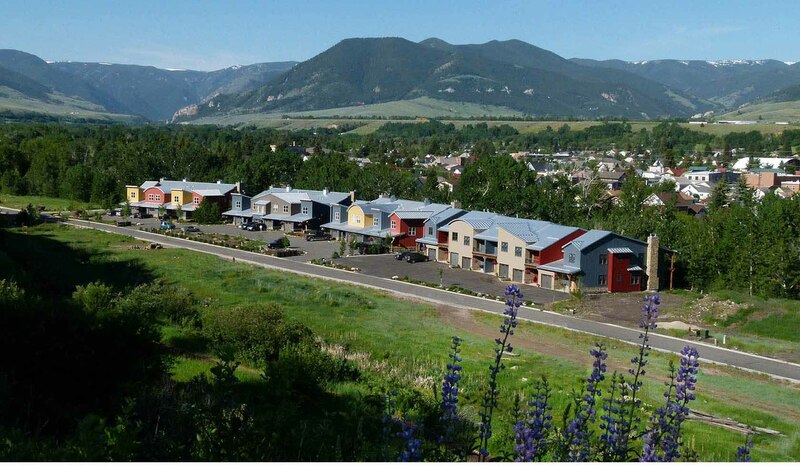 The Island at Rock Creek is Red Lodge's premier upscale development just three short blocks from downtown Red Lodge. We have 10 3 and 4 bedroom town homes for rent on Rock Creek just 3 blocks to town. Our town home 109 B is just under 2500 sq feet of living space with three decks overlooking Rock Creek. One deck off of living/dining great room and two upstairs off of the two master bedrooms. The third bedroom can be configured with 3 sets of bunk beds or an additional queen sized bed. The waterfalls and 4 ponds across the street are your front yard. We have a private hot tub next to Rock Creek just off the living room patio. Two gas fireplaces, wireless high speed internet, gourmet kitchen with gas stove top and electric convection oven, granite counter tops, hardwood floor downstairs, carpet upstairs, 3 bathrooms with showers, jetted tub in main master, flat screen TV in living room (we can add a TV to the bunk room with the game player of your choice for the kids if you like), lots of closet space with closet organizers, and views of the creek and mountains from almost every room!! 432 feet of deck area, gas BBQ, ceiling fans, air conditioning, and 350 square foot one car garage with two parking spaces in front of the town home and additional guest parking. Close to all activates. Red Lodge Ski Mountain only 7 miles from your front door. Golf is less than a mile away. Walking trails on site. Hunting, fishing, hiking, skiing, boating, all nearby. High end furnishings, new foam mattress or Sealy Pillow top beds, and air conditioning. Truly the best location and beds offered in Red Lodge on the Creek and close to everything.